Know thyself, the saying goes. In the auto industry, those words aren't just a hackneyed cliche, they are the key to survival--and to prosperity in a cutthroat field of competition. If ever there was a company that had that saying down cold, it's Mazda. There is no mistaking a Mazda product for any other, and every single one of their vehicles from the iconic Mazda3 to the sporty Mazda5 minivan. is imbued with sporty performance, terrific handling and styling that carries the hallmarks of the Mazda line. The company, in other words, knows itself well. 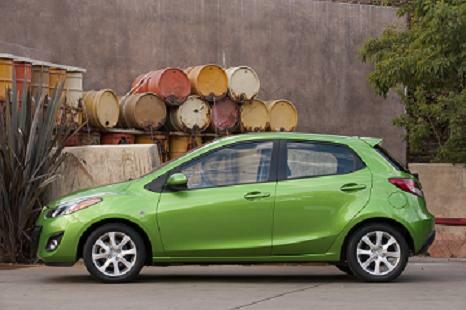 For 2011, the big story is the sporty new Mazda2 subcompact. Though Mazda2, introduced in 2007, is new to these shores, auto enthusiasts in other parts of the world know well that the little car already has racked up a slew of awards and compliments. It already has won 48 automotive awards, including "Car of the Year" accolades in many markets, including Japan, New Zealand, Chile, Bulgaria and Greece. Notably, the MAZDA2 was selected as the "2008 World Car of the Year" (WCOTY) at the 2008 New York International Auto Show and has established a distinguished position in the subcompact segment. Total global sales have reached over 400,000 units in the three years since its introduction Mazda's new baby comes in two flavors, making it easy to order and to cho0se from for consumers. First up is the entry-level Sport. It is equipped with a 100 horsepower, 1.5-liter four-cylinder engine and is available with either a five-speed manual or four-speed automatic transmission. Standard features include 15-inch steel wheels with full wheel covers, 185/55/R15 all-weather tires, body-colored door handles and power mirrors, air conditioning, power windows and door locks, AM/FM/CD/MP3 stereo with four speakers, audio auxiliary jack, tilt steering wheel, remote keyless entry system, rear window wiper/washer and 60/40 split fold-down rear seats. Then there is the MAZDA2 Touring which has either a five-speed manual transmission or available four-speed automatic transmission. All Touring models feature upgraded cloth seat fabric with red piping, 15-inch alloy wheels, fog lights, rear roof spoiler, chrome exhaust tip, leather-wrapped steering wheel-mounted audio and cruise controls, trip computer and a six-speaker AM/FM/CD/MP3 stereo system. Available accessories include a rear bumper guard, wheel locks (Touring models only), all-weather floor mats, cargo net, center console with armrest and auto-dimming rearview mirror with compass, Homelink® and orange backlit buttons. Stylewise, the Mazda2 is the epitomy of small car cool, with an aggressive "in motion" silhouette, hatchback practicality, and bright colors that accentuate the sporty profile and design of the car. A Mazda news release says, "In pursuit of a solid form and a richly expressive exterior design, Mazda established an exterior design theme of "coordinated movement". In line with this theme, the design team combined the visual movements created by the car's silhouette, its body lines, and the way in which patterns of light played on the body to create dynamic, multifaceted expressions not typically seen on a subcompact car." The news release added, " These expressions exude a powerful energy that makes the new MAZDA2 look as though it is moving while standing still. Key exterior design elements include: a sporty wedge shape that conveys a strong sense of forward motion; a deeply sculpted form in which the body is drawn inward fore and aft of the A-pillars; and distinctive character lines that extend from the front fender arches to the body shoulders." For a car of this size, Mazda2 is pretty generously equipped with safety features. All MAZDA2's include anti-lock Braking System (ABS), Dynamic Stability Control (DSC) with Traction Control System (TCS), Electric Power Assist (EPAS) steering system, "Triple H" body construction, side-impact door beams, crushable brake and accelerator pedal assembly, advanced dual front air bags, front seat side air bags, side air curtains, engine immobilizer anti-theft system, second row LATCH child safety seat anchors and a Tire Pressure Monitoring System (TPMS). The Mazda2 will also be the first Mazda vehicle launched in North America with Mazda's Brake Override system. This system always prioritizes the brake pedal over the accelerator pedal, should both be engaged simultaneously, allowing the vehicle to be brought to a safe stop. Activation of this system will be recorded in the electronic Powertrain Control Module (PCM) and will be readable with the correct equipment. Mazda is planning to roll out this new system to all future Mazda vehicles in North America during the 2011 model year. Mazdas officials say that there are two levels of driving e4xperience to be had in the Mazda2. One is "a sense of linear acceleration and deceleration that responds crisply to how far the accelerator pedal is depressed, allowing the driver to control car speed as desired; and 2) a sense of liveliness through immediate response to the accelerator for quick off-the-line acceleration and overtaking. The development team targeted a performance feel reflecting enhancement of both of these key attributes without adversely impacting on the MAZDA2's superior fuel economy as a subcompact car," a news release says. As for fuel mileage, Mazda2 delivers on that, too. If you choose the five speed manual, you may expect/35 MPG (city/highway), while models equipped with available four-speed automatics are expected to return 28/34 MPG (city/highway). Mazda2 prices start at under$14,000. 2011 Mazda3 Mazda's hot little compact defines the brand in people's minds perhaps more than any other model except for the Miata, and there are now almost two million Mazda3 owners around the world, and one in every three Mazdas sold worldwide are Mazda3 models. 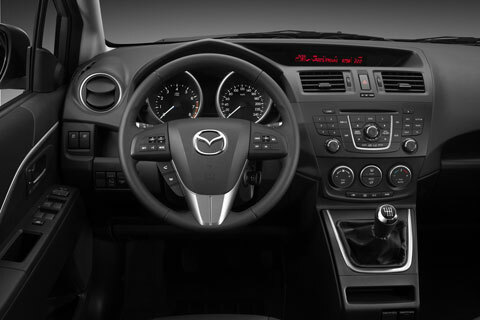 And despite being all new for 2010, the Mazda3 comes in for quite a few changes in 2011. First, all Mazda3s now get standard Dynamic Stability Control (DSC) and Traction Control (TCS) on all models, and you'll be able to get power door locks with auto-lock funtion on the i SV and i Sport models .Rain-sensing wipers, auto on/off headlights, Bi-Xenon auto-leveling headlights, Adaptive Front-lighting System (AFS) and rear LED taillamps available on s Sport models withautomatic transmission, and the s Grand Touring version gets standard 265-Watt Bose Centerpoint 10-speaker surround sound audio system with Audiopilot (s Grand Touring). In dash six disc MP3 compatible D changer is now standard on the s Grand Touring model, coolant "low temperature" warning light is standard on all models. Meanwhile, a moponroof with one-touch open is standard with the sGrand touring version. Power for the Mazda3 comes from either a 148-horsepower 2.0-liter or a 167-horsepower 2.5-liter dual-overhead-cam 16-valve 4-cylinder engine Among the many choices yu'lll have to make on yur Mazda3 will be whether to order self-leveling Bi-Xenon headlights, Adaptive (steerable) Front-lighting System, Advanced Keyless Entry with push-button start, hands-free Bluetooth cell phone and audio player integration, and 10-speaker BOSE Centerpoint surround sound audio system. Interactive lighting with welcome mode, variable heated front seats, power driver's seat, dual automatic climate control and compact navigation are just some of the features also available. Package/option changes for 2011 include the addition of rain-sensing front wipers, auto on/off headlights, Bi-Xenon headlights with auto leveling, Adaptive Front-lighting system, and LED rear combination taillights to the Technology Package. Mazda6 One of the sexiest family sedans on the planet, Mazda6 also happens to be one of the fastest --and best handling ones, too. For 2011, "The 6" gets modifications that are upgrades to its interior--a good idea given the hot copetition among intermediates that all hae upated, rich looking interiors. Among the interior changes are wew cloth seat materials, new steering wheel design, new instrument panel premium trim accents, new stitched vinyl door armrests and other upgrades. Meanwhile, fuel economy is slightly better. Mazda6's i models with manual transmiussion are now rated at 21/30, while i models with an automatic are rated at 22/31. Meanwhile, s models are rated at 18/27. 2011 Mazda5 This is the other new model for Mazda this model year, and it is dramatically different from its more conservatrive lookiing sibling now on the market for 2010. The 2012 Mazda5 now includes Nagare "flow" ] design language, featuring what Mazda is calling a "groundbreaking exterior design, with expressive lines flowing from the vehicle's front to the rear. Nagare design is also reflected throughout the cabin, from the instrument panel to the stitching on the seat covers." Meanwhile, one of the few knocks that auto writers made against the Mazda5--that it lacked enough power--has been adressed with an all new 2.5-liter DOHC I4 engine. 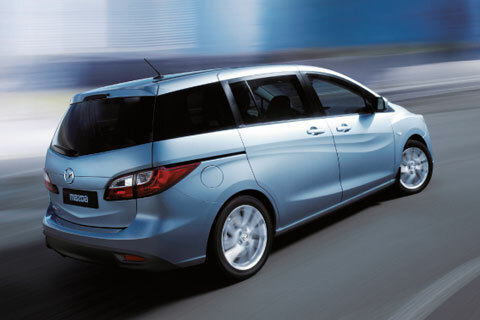 fuel economy for the automatic equipped Mazda5 is up by two miles per gallon to the high twenties. 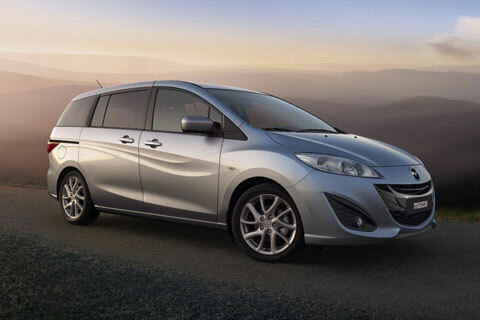 No price announcements have been annoubnced for the 2012 Mazda5.